The teacher dictates 3 or 4 exercises on BASICS, that is, vocabulary essentials, numbers, telling the time, formulaic language, verbs, idioms, conjugations, transformation of short sentences, et cetera) to be done immediately in the classroom by the students. All the students are to stay sitting separately as if taking an examination, although the activity equals a simple test. a/ check that your own teacher´s talk (pronunciation, intonation, English language) is clear. 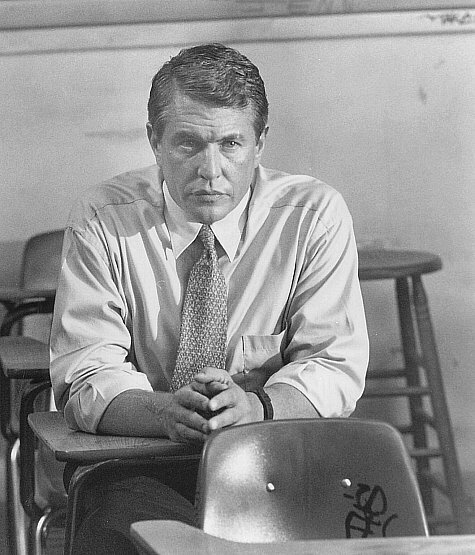 Tom Berenger as Jonathan Shale in “The Substitute“. In tests, controls and examinations teachers must avoid questions on BASICS which could be easily copied on a slip of paper. Do not feed cheaters! *Are you coming with us to the zoo tomorrow?